Located right next to the new award winning, Skyline High this property is ideal for growing families. Offering luxury brick built properties in a beautiful setting, convenient for all Ann Arbor this community really does offer it all! This upscale community’s peaceful setting amongst mature woodland is just 3 minutes from downtown Ann Arbor as well as accessible via several expressways. Constructed by Toll Brothers, Walnut Ridge offers a great lifestyle for all its residents. There are 182 units that were constructed between 2002 and 2007. Homes are semi-custom and range in size from 3400-5400 square feet – these homes are situated on sites from between one half to one acre with original trees remaining on the lot as much as possible. Inside the homes there are often dual circular staircase foyers, lower levels, sunrooms/conservatories, master suites with sitting areas and much, much more! The community also benefits from fifty acres that have been reserved for natural areas with walking trails. 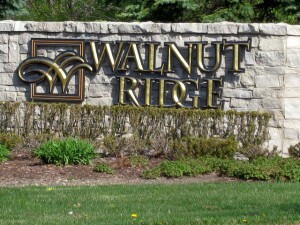 Walnut Ridge has an active Homeowners Association. Association fees are approximately $1,000 annually. Parents will be happy to know that children attend award winningAnn Arbor schools. Tour inside schools. Residents pay Scio Township taxes.